THE BAD - A tad derivative. The third act isn’t as effective as the first two. ​​​​​In recent years, the film industry has blessed us with a return to the science fiction spirit of the Stanley Kubrick era. In the midst of more and more CGI heavy superhero films, it is refreshing to have films like “Ex Machina,” “Moon,” and now “I Am Mother” that put philosophical questions and character first and foremost. Although occasionally derivative, “I Am Mother” is a thrilling and twisty science fiction romp with incredible performances and below the line elements. Set in the aftermath of the apocalypse, a robot known only as "Mother" (Voiced by Rose Byrne) raises “Daughter” (Clara Rugaard) from an embryo-up as the first in a line of new humans to restart the entire race. Educated with a deep understanding of the complex moral philosophy, Daughter must soon put her knowledge and understanding to the test when another human (Hilary Swank) arrives injured and hostile towards Mother. The film’s underground lab setting and lingering questions of what constitutes humanity and morality have been explored before by other recent sci-fi films. In fact, many of the plot elements here have been done before. But with good sci-fi, there is no shame in returning to the already treaded ground if the execution is exciting. Which, courtesy of stylish direction and a twisty script that keeps you guessing, “I Am Mother” is and then some. Not merely content to serve as an unpredictable thriller, the film is aware that advances in technology will force us to make increasingly more difficult philosophical decisions about utilitarianism and the value of human life. As such, it forces the audience to re-evaluate their allegiances with some frequency. Like "10 Cloverfield Lane," time and time again, the film seems to have given you all of the answers, only to pull the rug out from under you. Even if the third act seems to be a let down after the twisty first two acts, it still manages to fling a surprise or two at the audience. Meanwhile, the small all-female cast works hard to sell the film. Hilary Swank delivers far and away her best performance since “Million Dollar Baby,” while newcomer Clara Rugaard makes for an engaging and likable lead. The titular “Mother” robot boasts such a palpable physicality aided by phenomenal voice acting from Rose Byrne. Despite having a robotic face, she communicates evocative emotion, creating a seemingly sympathetic character. Perhaps the film’s most impressive achievement is its ability to create thoroughly complex and detailed sets, along with incredibly lifelike visual effects on such a small budget. The film genuinely looks better than many $100 million blockbusters. In addition, the editing moves along briskly (especially in the first two acts), while the sound design is inventive and the score immersive. 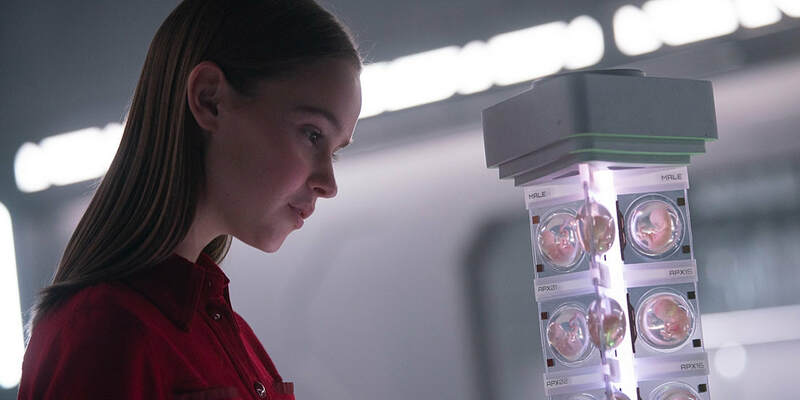 “I Am Mother” doesn’t re-invent the sci-fi wheel, but it is a damn good effective yarn, that proves director Grant Sputore is a force to be reckoned with.